My 740 has a cracked vertical gear. It was fine just days ago. Totally fine. I have no idea how it broke since I’ve hardly used this machine, but I noticed it today turning over the balance wheel by hand. 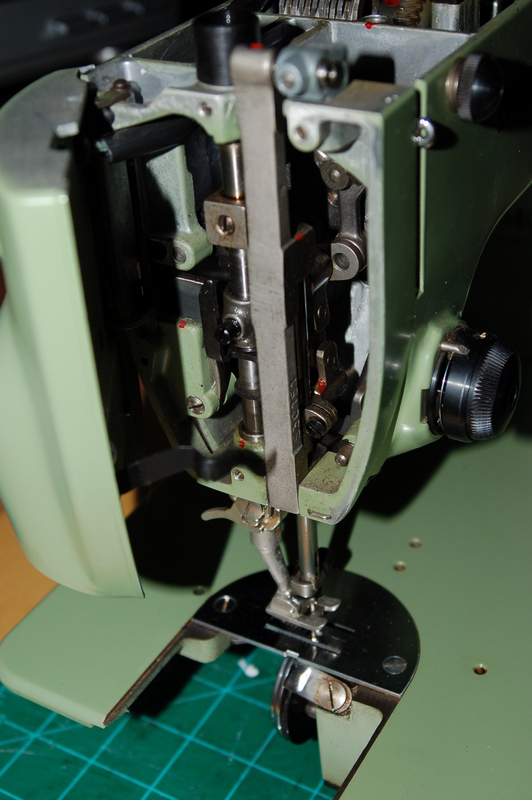 It’s a slight catch, like when thread is beginning to jam or there’s some issue with a bobbin. 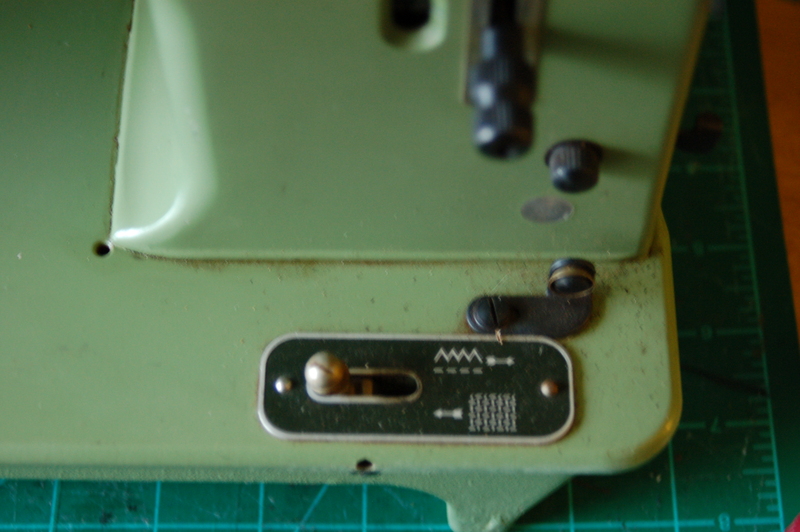 It took me a few minutes to realize that the vertical gear in the Bernina was cracked completely through. There’s a gap in the teeth, and when the teeth of the other gear get misaligned because of it, that’s when there feels like there’s a catch in the machine. On the plus side, I might be able to fix it. Eventually. 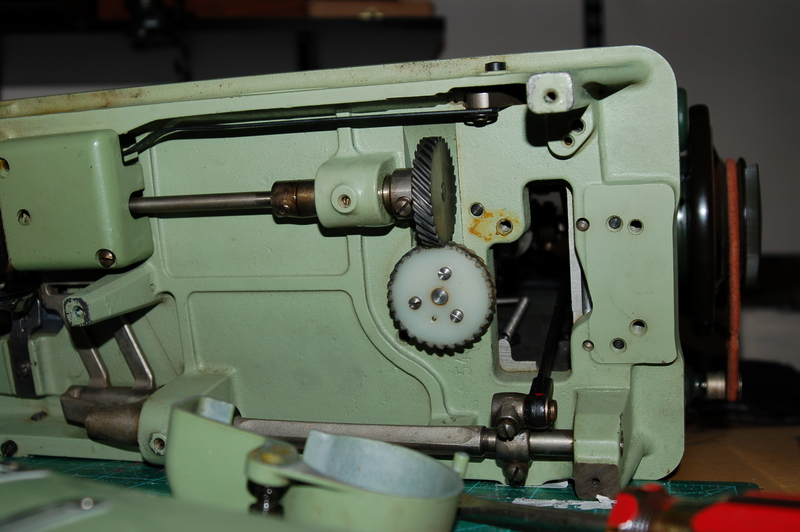 I’m signed up for Ray White’s super legendary awesomeness SEWING MACHINE REPAIR CLASS next month. I had no idea the White Sewing Center is but a two hour drive from my humble abode so I will be revisiting my former life as a commuting student and driving back and forth for the three glorious 8 hour days with fellow obsessives. I am beyond excited about it. I only signed up for the basic class, which likely will not cover the mad drama and heartbreak of taking apart a machine to replace a gear, but it will definitely teach me enough about the interconnected systems of the machine to be able to adjust the timing and any other things I might mess up in the process. 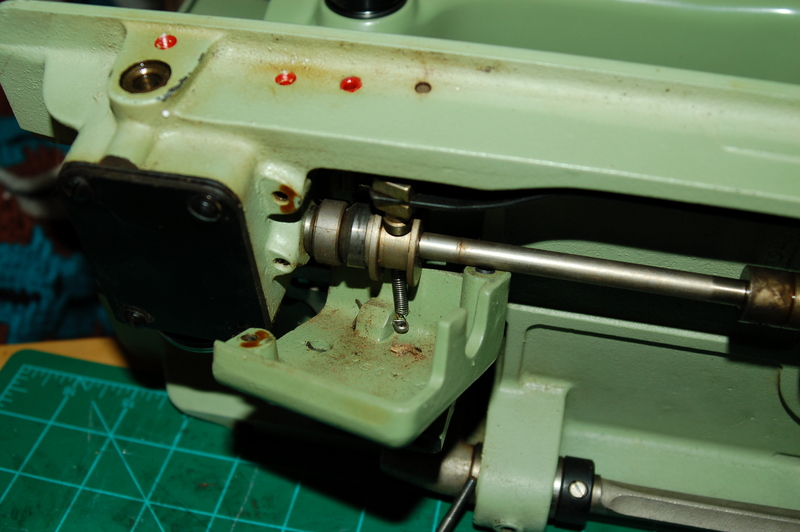 I don’t want to undertake this repair till after the class, but when I do, I will be documenting it extensively (because abandon all hope, ye who attempt to dismantle any part of a sewing machine without photographic help retracing your steps) and will share my progress. A view from above. 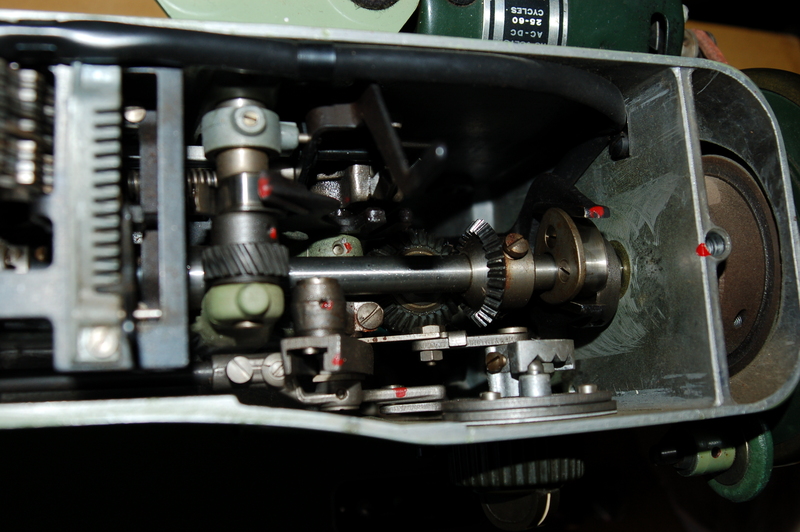 The silver toothed gears are the decorative stitch cams; my lever is frozen at the moment so even if the machine ran, not usable. Visible close to them is the dirty looking white-ish gear–it’s one of three or so that is nylon/silicon/some kind of mystery crap sixties plastic prone to breaking. I do love that the oil points are clearly marked in red. Another top view. 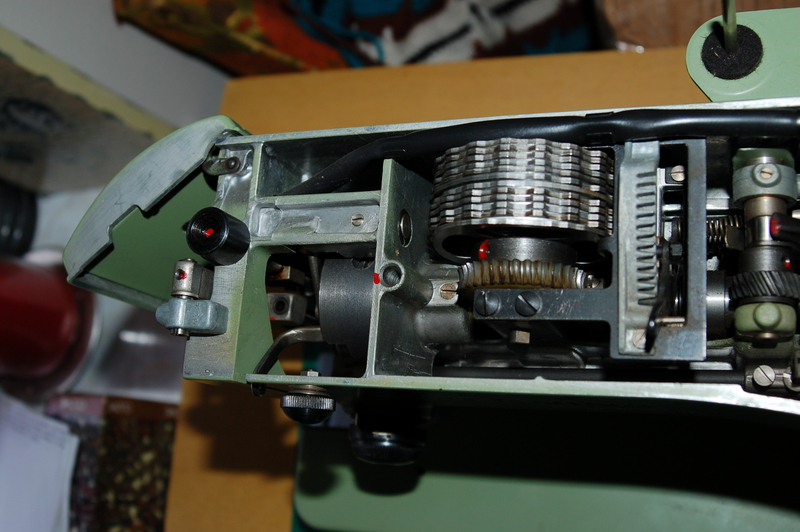 Under the main shaft is the vertical gear (I think), another plastic gear. This is what cracked in my 740. It’s interesting that the needle position selector in this one is a wider pin and moves very freely; this is bound up on some of my other Berninas and not TriFlow nor BlueCreeper nor sailor names has pried it loose yet. Oh, look, my cracked hand wheel. No one knows how to pack sewing machines except sewing machine obsessives. It’s sad. I’m not even mad about it, because luckily there is a metal core like a common metal stop motion knob which will keep it functional even if all the plastic crumbles away. Behold the disintegrating belt. It feels like a cloth covered elastic hair tie, which is interesting and a bit different than the other belts I’ve seen on machines of the era..
Front view. Cosmetically, she ain’t bad. I like the avocado green, though, because I’m stylistically perverse like that. Interesting details that differ significantly from the Records and other Berninas I’ve seen. No buttonholer lever, but a toothed setup instead. The decorative stitches it can do. Theoretically. The back view, where the dust is a bit more obvious. It has a three pin connector power cord/speed control pedal. I have a flatbed Husqvarna and a Pfaff 130 that use this same somewhat uncommon setup. It took me forever to find a cord that would fit this shape. Underside. The machine looked pretty clean so I was surprised to find it so bound up, but it was dry as a bone and so dusty. The Favorit models I’ve seen all have these covers on the underside obscuring the gears. I’m not sure if it’s because the Favorit hook system is supposed to be faster and more heavy duty than other Berninas and they felt a need to have an extra protective layer over them, or if these are more like oil pans, or what exactly. But the black cover houses the hook gears which are metal on metal and need lubricant. 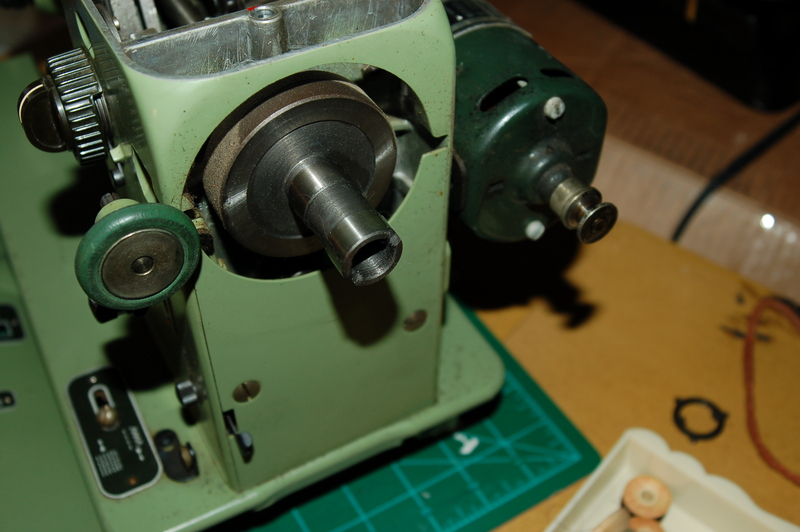 I removed the stop motion knob and the balance wheel and oiled the main shaft here. 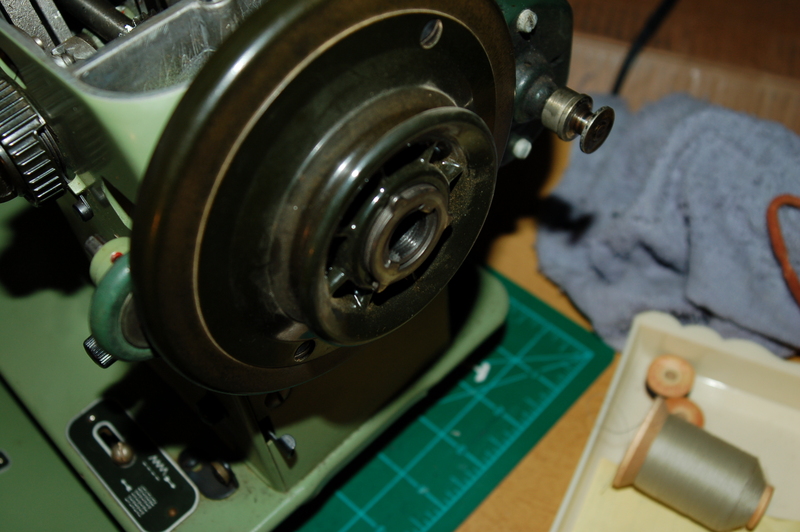 The clutch washer and stop motion knob work just like a typical Singer’s. 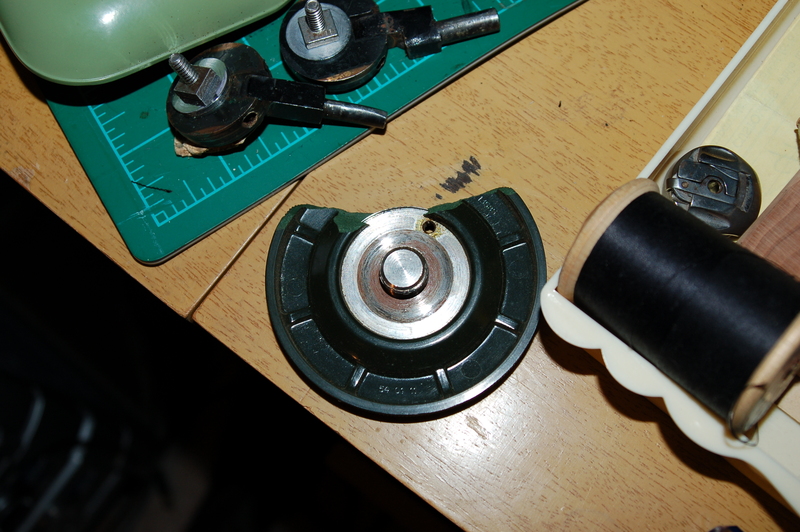 Here’s the third nylon/plastic gear with its cover removed. 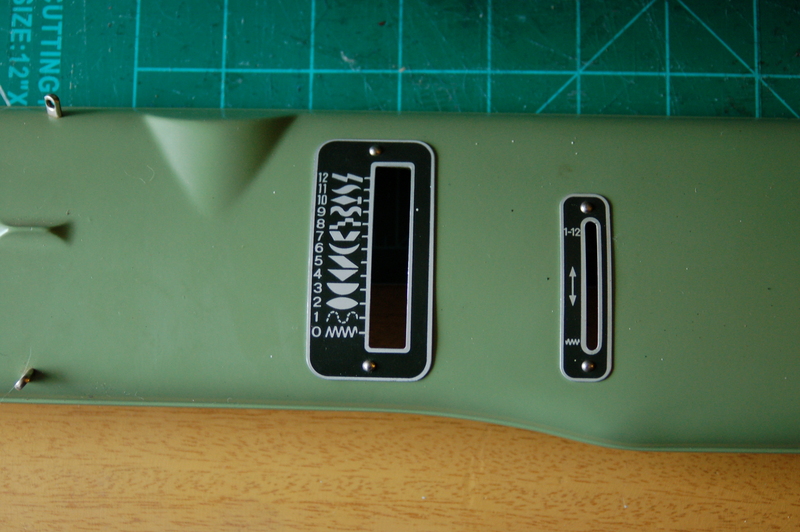 The middle cover removed. Not a gear, but grooved metal parts that move against each other. Not sure why this cover is held on with a spring, either. So ends the tour. We’ll see what the BlueCreeper does overnight. The Necchi facebook folks turned me on to the wonders of this penetrating lubricant. I wouldn’t use it for oiling a sewing machine but it’s great at breaking loose stuck parts–apparently it’s used heavily in the logging industry to loosen rusted screws and a billion other things. I have been very impressed by its ability to un-stick what TriFlow couldn’t on another machine. It seems to need a few hours to really get in to all the cracks, so we’ll see how it works tomorrow. Today was not a good day for hoarding. Enjoyed this immensely. Have made a few buying mistakes on machines but what a great feeling when you get one to work. My dog won’t sit in the room with me when I work on machines…..thinks I am yelling at her. That’s too funny. My cats like to “help” but I live in terror of dropping a machine on them one day. You’re right, though–nothing better than getting one that seemed beyond hope running well again. It’s completely addictive! 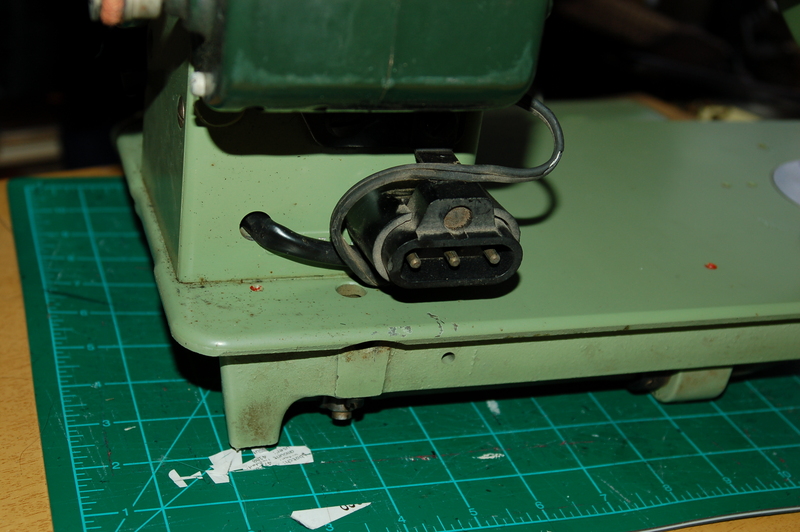 I recently purchased a Bernina 540 Favorit (1959) with the same problem. My set up is similar to your machine with same mechanical system. I took a pair of flat pliers, wrapped teeth of pliers with heavy weight denim to protect plastic handle, put plain sewing machine oil on all parts, including seams inside of handle, then blew a blow dryer on parts to heat for a few minutes, then GENTLY wiggled pliers back and forth while grasping handle with fabric in between for protection. By doing this repeatedly for a while, I finally was able to get knob to turn back and forth. It turns easily with pliers, with difficulty by hand. I plan to repeat process over several days to give new oil time to work. The heat helps dissolve the old gunk so the new stuff can work through and force the old stuff out. Ahh, wonderful! I have tried something similar but never with the denim wrapped pliers. I definitely will give this a shot. Thanks for sharing a great set of tips for this oh-so-frequent problem! My mother tracked down one of these for me. I gave it to my wife for Mother’s Day yesterday. I don’t mean to gloat, but it is in immaculate condition and seems to work perfectly, other than the long-since-decayed belt. It’s in a folding table with a Pfaff-branded ruler apparently printed right on the table, and it doesn’t even have a scratch in the ink. I question how much use it ever got (which makes it a wonder that everything moves easily). Anyway, as you noticed there is precious little information about these machines, so thank you for posting all these great photos! Gloat away, it’s always great to hear someone is using and hanging on to a great old machine! It’s wonderful. Isn’t there something about grandmothers’ machines? I still wish I had my grandma’s treadle. I think I got my machine working but then the brittle wiring beneath crumbled away and left exposed metal wire–inches of it!–so I benched it till I can do some rewiring someday. That’s a common problem with many of my old machines that are hitting the 60 year mark or older, sadly. An easy fix if one knows how, but i need a babysitter my first few attempts! 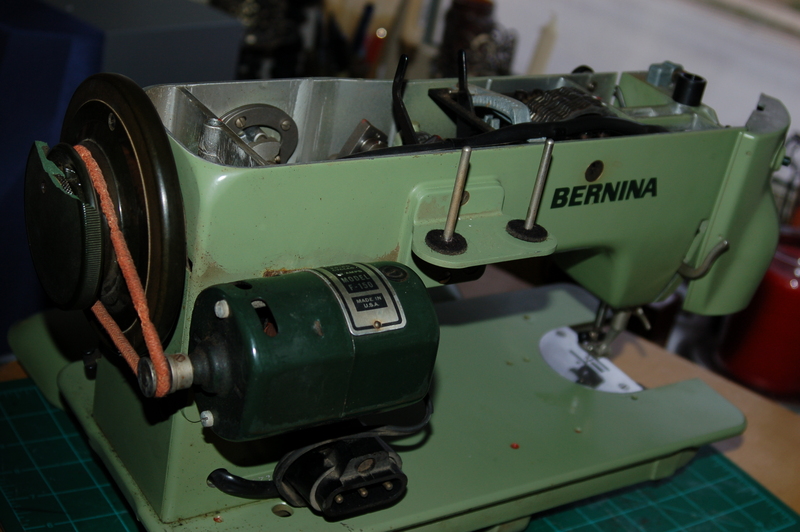 My Bernina 540 was purchased several years ago (okay, more like 12 yrs ago) on ebay. Sewed like a sweetheart for a few weeks, then one day made a “clunk” noise and… stopped. Never to move again. The motor hums along fine, but something has locked up something else. 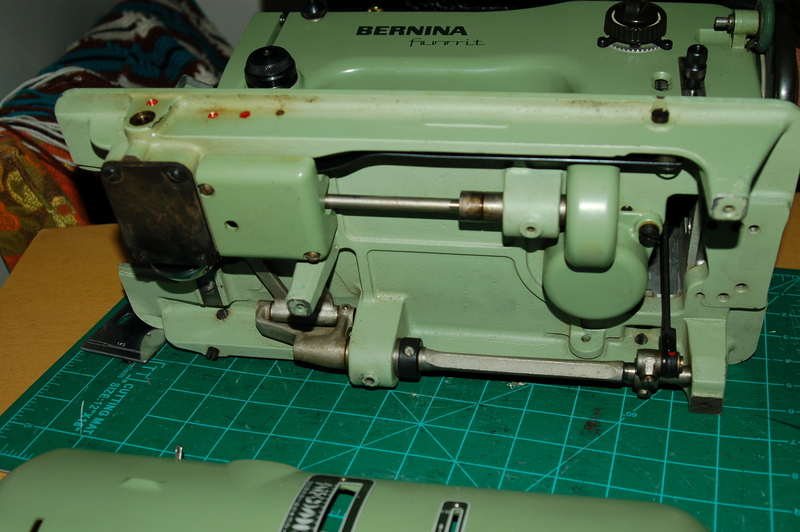 Our local repair insists it’s too old to bother with (but would I like to buy a nice, new Bernina??). It’s sat, lonely and unloved, in a closet until this week. My husband is a BMW motorcycle mechanic, now retired, and willing to take a look at it. I know BMW isn’t much like Bernina, but it’s a mechanical machine, not a computer chip in sight, and I’m hoping for the best. Did you ever get yours working again? Any hints or tips? Clues? 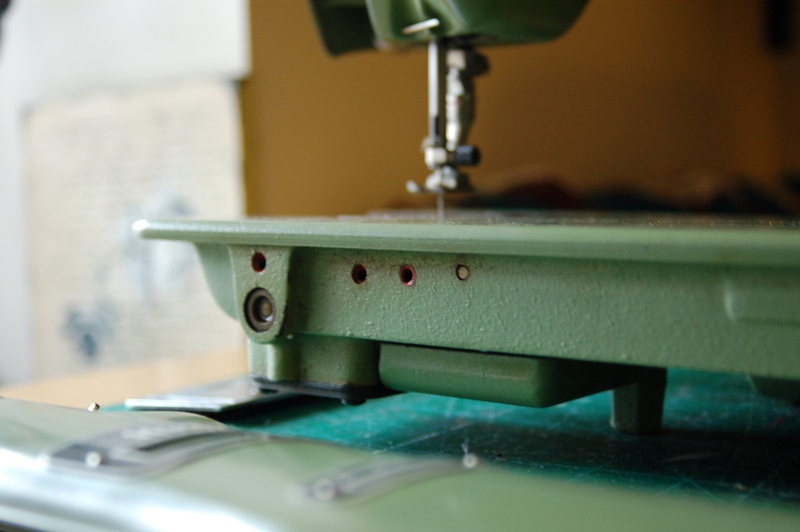 I dearly love these old workhorses, but I love ’em even more when they sew. I would take anything that a repairman who thinks it’s too old to bother with says with a grain of salt. I’d trust a mechanic to be able to figure it out though! If the motor runs, it’s probably something in the machine that’s stuck–mine did this with a tiny, tiny thread stuck in just the right place. 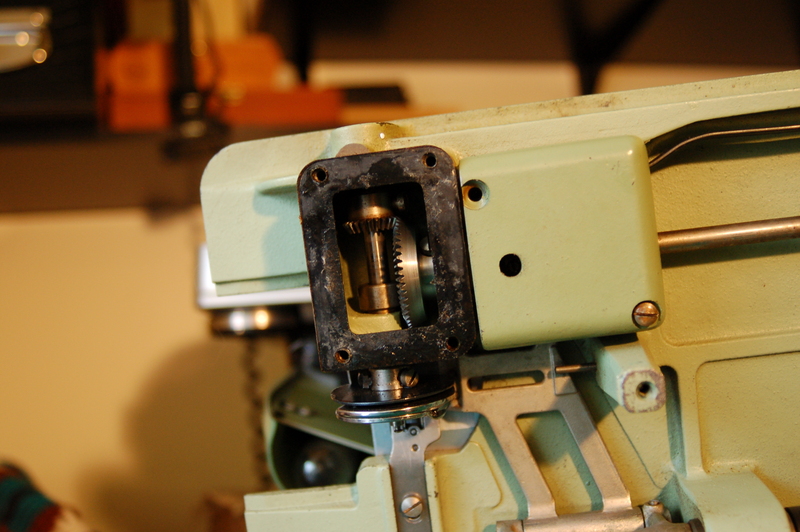 The clunk part is puzzling–there are a few gears that are plastic or nylon that sometimes break on these, but you would still be able to turn the machine. My guess is, silly as it sounds, that it probably needs lubrication. My first line of attack would be checking the bobbin area for any minor obstructions, but my second would be adding a little drop of tri-flow (a great lubricant that gradually breaks down old hardened sewing machine oil) or, if really desperate, Blue Creeper, a lubricant they use for logging! Those two have saved machines for me. Lubricate all moving parts or places where the metal rubs against metal. Let it sit a day or two if need be. Also try a hair dryer on it after lubricating-the temperature change helps the new lubricant get in where it needs to be and softens old gunk. Really! I did this every day for a week on a machine I thought would never work and saved it. Good luck! If I can help further, let me know! Loved your article and all the pictures. I was recently given one by a friend at work. It was sewing just beautifully and then clunk it stopped. Thread was wrapped around the bobbin case and hook. 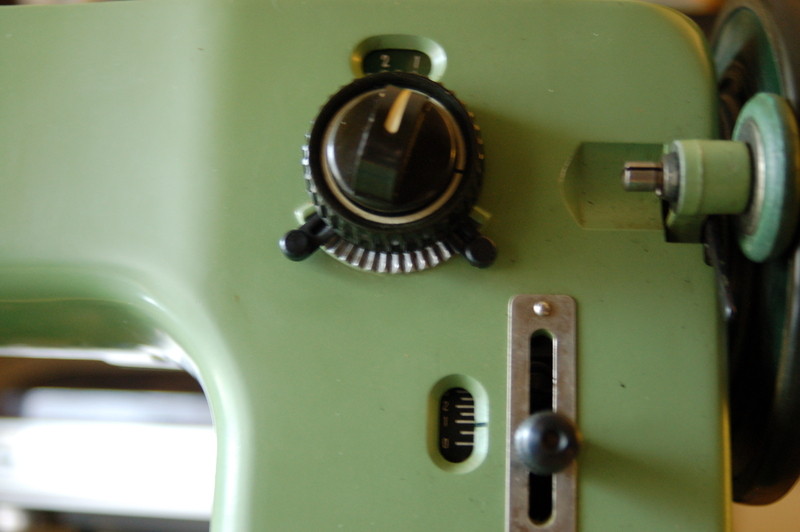 The finger positioner had locked onto the hook assembly. Forgive my lack of knowledge here. 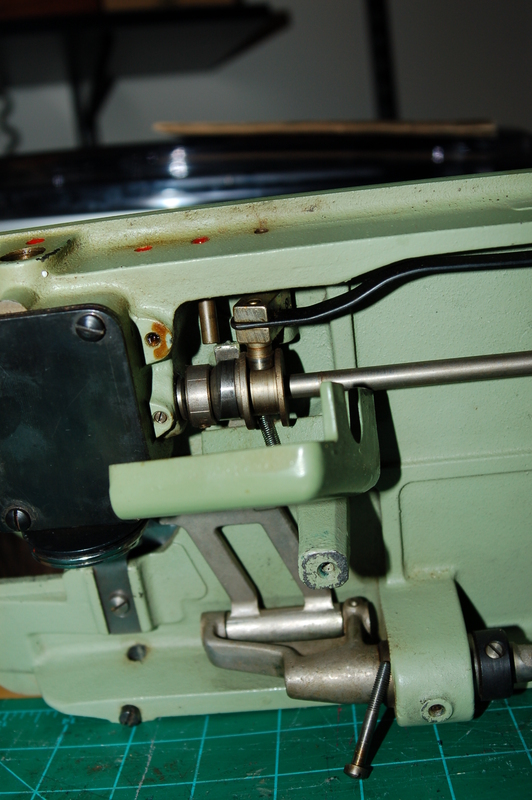 Then I noticed that one of the little prongs on the positioner had broken off. 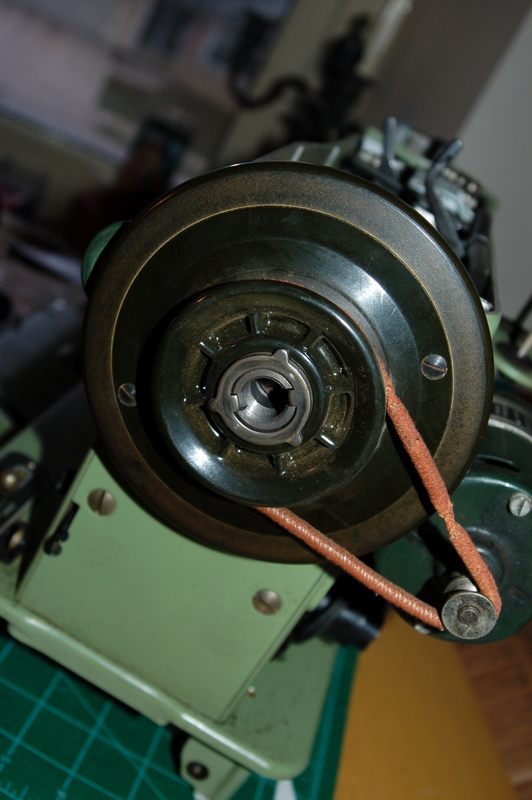 Now all it will do is wrap thread around the bobbin. 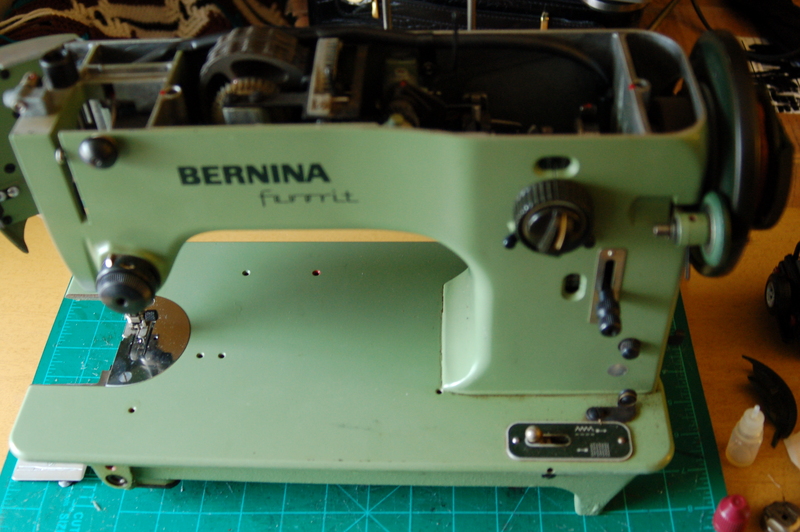 I have searched ebay, called Bernina, and any number I could find with Bernina parts. No one yet has had the part. If you happen to know anyone with parts for these please let me know. Ebay is kind of a crapshoot, since a lot of replacement parts are poorly machined and made overseas and sometimes don’t even fit the machines they’re intended for. Rick, that’s funny timing. In getting the one I mentioned above working for my wife I have been having the same problem. The needle-hook timing was off, to the point that the needle would crash and break, but I got that fixed. 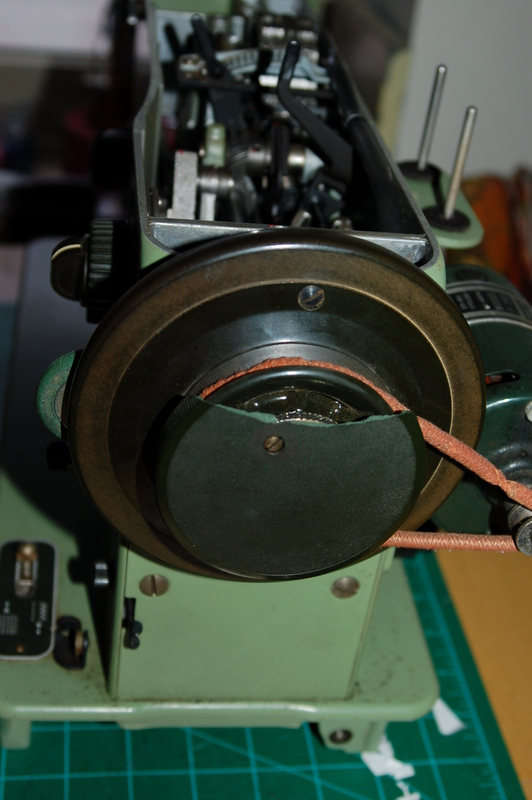 Now I’m trying to resolve a pesky issue where the main/top thread gets stuck/wrapped around the bobbin cage thing instead of slipping over it and back up with the bobbin thread. Bernina tells me they don’t even have the original service manuals or diagrams anymore. Not even on microfilm?? That is either a lie (too lazy to help or something??) or a terrible customer service decision. I can see not carrying parts after a certain number of decades (ours is a 1953), but to not have the service documentation?? Poor form. I mentioned this to my mother, and that I can’t even find a video of it in operation showing the correct movements, hoping she could recall having used this type well enough to help me troubleshoot it, and she said, “Oh, I still have Grandma’s machine in the basement. I’m pretty sure it still works.” What?! It’s too sentimental to be able to part it out or anything, but there is a *chance* that I could fabricate a replacement based on these two that I have. Do you have the 740 that is the subject of the post or the 540 like those of us commenting? Incidentally the “clunk” that both other recent commenters have mentioned is exactly how I would describe it when the thread gets stuck. The manual says that the thread problem is “inexperienced operator error”, but my wife knows plenty about how to do this, and I’ve tried as well, handling it exactly as I see successfully done in a couple of YouTube videos, and it still happens. So frustrating. Thank you! I have the 540. I would post pictures of the parts but I can not figure out how to do that. I would be so very happy to get it running again. I am gonna give the whitesewing.com a try. It would be very helpful to be able to see how one runs. I wish I had done that before it stopped. If I remember right, my 540 is currently out of commission because the wiring crumbled away on the bottom and there is bare metal wire exposed, so I can’t actually run it. But if it would be helpful, I can definitely try taking some video of the motion of all the parts, turning it by hand. I’ll try getting that posted for you over the next few days or this weekend! I’ve enjoyed reading this. I bought a Favorit 540 probably a month or so ago and stumbled across your blog. Things got crazy busy here and I haven’t yet had the chance to do more than clean it up and unstick the cam stack. Thank you for the hair dryer tip. It really worked! Now I think I’d better haul it out again and take a look at the wiring. Does anyone know where I can find a slide plate for my machine? I’ve seen replacement needle plates, but not the slide plate.